Bill Carr Chairman of the Dalwhinnie Community Council who are campaigning for a reduction in traffic speed through the Badenoch village. Highland residents are demanding a rethink by the Scottish Government after its officials turned down a speed reduction through a busy tourist village. Dalwhinnie councillors and the community council, backed by the area’s MSP Kate Forbes, want a reduction in speed on the former General Wade road, to the side of the A9 which is the main route between the east and Fort William and Skye. 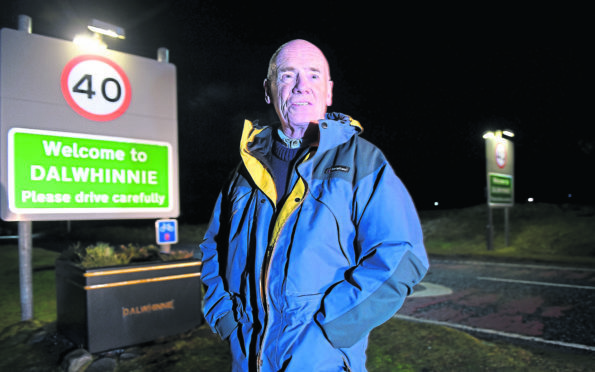 Bill Carr, chairman of Dalwhinnie Community Council, said that meetings with Transport Scotland, police and Bear Scotland had – so far – not managed to get any concessions to lower the speed limit. Mr Carr continued: “The A898 through the village used to be the A9, until it was upgraded in the 1990s. People continue to drive through the village at speed, and that doesn’t always mean they stick to the speed limit. “We have had temporary traffic lights in the village for a number of years, and we have much heavier traffic in the area. “It is the main route from the A9 to Skye and for people visiting the distillery, therefore it is a very busy route. “We have a narrow footpath for all the people who travel to the village, or arrive here by train. There are increasing numbers of haulage vehicles using the road. A spokesman for Transport Scotland said: ““Road safety is a priority for the Scottish Government and we have recently met with Kate Forbes MSP and the Dalwhinnie Community Council to understand the concerns of the community.